Sugar Creek Hideaway is the perfect place for your family vacation or just a weekend getaway. Nestled in the beautiful and tranquil Little Sugar Creek Estates in Blue Ridge, GA, this cabin offers convenient paved access and is located only minutes from the quaint downtown area of Blue Ridge, GA. Here you will find unique shopping, fabulous locally owned eateries, a scenic railway, and all of the natural beauty found in the Georgia Mountains. While you are here, enjoy whitewater rafting on the famed Ocoee River or tubing in the Toccoa River for a more relaxing ride. Also, just minutes away from Sugar Creek Hideaway cabin, is Mercier’s Orchards, horseback riding, hiking to waterfalls and access to the Appalachian Trail. This tastefully decorated cabin offers all of the luxuries of home and can sleep eight comfortably. Sugar Creek Hideaway has three bedrooms and three and a half baths. The master bedroom is on the main floor with a king bed and a Jacuzzi tub in the master bathroom. The basement is equipped with an air hockey/pool table combo, Wii and a large flat screen TV. There are two large screened porches for relaxing and enjoying the cool mountain air and from the lower porch you can walk to the creek and enjoy a fire in the fire pit. At Sugar Creek Hideaway you can let all your worries go by the wayside as you relax in the Jacuzzi tub in the master suite or the hot tub outside on the screened porch. Play a fun game of pool or air hockey or roast marshmallows at the fire pit next to the creek. Don’t wait! Think "vacation" and book this beautiful cabin today and enjoy all this area has to offer. 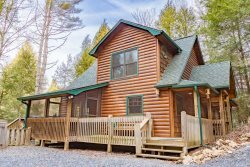 This North Georgia Mountain Cabin Rental is located approximately 5-7 minutes from Downtown Blue Ridge, GA. The cabin is on Little Sugar Creek, on the North side of Blue Ridge, which is very close to the Mercier Orchards, whitewater rafting on the Ocoee River, Adventure Trail Rides for Horseback Riding, the Toccoa River, and Lake Blue Ridge. Sugar Creek Hideaway is very private and is considered a secluded Blue Ridge Cabin Rental. Excellent customer service and everything was as expected when I arrived. The staff even called me the next morning to ensure everything was okay. I would definitely recommend anyone who is looking for a cabin to start with this company. It was very pleasant reserving the stay and checking in. Great information was given to assist during the duration of the stay. We enjoyed the cabin so much we felt at home and didn't want to depart. The cabin was decorated beautifully for the occasion and it was a very pleasant time for us. The staff was friendly and on point. Been renting from Paul for over ten years ...he has always taken care of me and my grandfather. The group of people at Georgia mountain cabins were very accommodating and kept us up to date on weather conditions. They went over all the paperwork before we left the office , and we were able to get into our cabin a little early as we requested. The team was awesome. Very courteous and helpful! We loved it and cannot wait to return! The entire space was perfect for what we wanted which was time with cousins who hadn't been around each other much in our adult years. We loved it all, even the fire pit that we couldn't light ha! The GMCR team was simply amazing! We have been coming to BR for 5 years and had nothing to compare it to until now. We will only rent through GMCR from now on. It means a lot when you are planning a vacation and the team you deal with TRULY cares about your stay!!! This was the most Amazing stay in Blue Ridge by far. We have been coming to BR for 5 years to spend the Thanksgiving holidays. This is the first time we used Georgia Mountain cabin rentals. They were professional, thoughtful and kind. I cannot say enough good things about their quality of service. We will only use them from now on!!!!! Keep up the good work. It really means a lot. Top- Notch!!! GMCR is the BEST:) This cabin was Awesome! It was clean and neat. The dcor was classy:) The cabin had all the amenities. The added Christmas decorations were a plus:) My family had the best time ever. I hope we can rent this same cabin next year!!! Everyone was great when I called and answered my questions. My daughter and her friends enjoyed themselves. Great property. Everything was great. Family truly enjoyed the home. Amber was so friendly. I spoke with her on the phone prior to making it up there and she assisted me at both check in and check out. She was super sweet and so nice and understanding considering my family constantly calling and making things more difficult than needed to be. The cabins were very nice and clean. The staff was super friendly and accommodating. I was able to make payments towards the total and easily alter details. The cabin was the perfect getaway from our lives. The cabin was well decorated and cozy. The cabins were very nice and clean. The staff was super friendly and accommodating. I was able to make payments towards the total and easily alter details. Sugar Creek Hideaway was very clean and cozy. It had an awesome fire pit and lovely view. Very relaxing setting, especiall this time of the year with the leaves changing color. Loved it. Was peaceful and relaxing. The cabin was beautiful , provided plenty of space . Hot tub was soothing and relaxing . The location was great . Loved the creek and firepit . We enjoyed your cabin . We vacationed at a non-peak time of year. The downtown of Blue Ridge was great. Many attractions are seasonal, so we were not able to participate in those-tubing, zip lines, etc. but I can see how great it would be in the summer. I t was quiet and very relaxing. I wish the hot tube was covered so that it could be used even if it rained (which it did for half the time we were there). The people, cabin and view were all incredible. I would (and have) recommend anyone to stay with this company and this particular cabin. You will see me again in the early fall! Very friendly and helpful staff. Sugar Creek Hideaway was everything advertised by your company and more. Beautiful and well stocked with video's and games.Very family oriented. Even with some rainy weather we had a great time. We live in NC and have stayed in many NC cabins. Yearly we visit TN, Pigeon Forge area and rent different cabins. This company and cabin rated with the top of cabins and companies we have used in the past. First visit to Blue Ridge, we will be back. Thank you for a great time.